Drepung Monastery is one of the six Gelugpa Monasteries in Tibet. Its Tibetan name means “Rice Heap Monastery” indicating prosperity. It is located about 5 km from the west suburb of Lhasa on the Gambo Utse Mountain. Together with Sera Monastery and Ganden Monastery, it is one of the three big Gelugpa Monasteries in Lhasa. Moreover, it has the highest status in Gelugpa Sect. 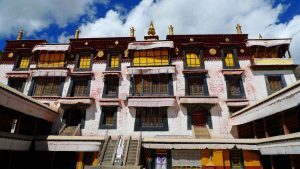 So, it is worth a visit for a Lhasa day tour for Drepung and Sera Monastery. In 1416, Jamyang Choge Tashi Palden (1392-1449) founded Drepung Monastery in Ming Dynasty. Jamyang Choge was one of the main disciples of Tsong Khapa. In 1409, Tsong Khapa founded the Gelugpa Sect and built Ganden Monastery. After that, Gelugpa has greater influence and more believes. Thus, Drepung Monastery was built under that background. The Seven Disciples of Jamyang Choge managed the Zhacangs (the academy of studying Buddhism). Drepung Monastery is the mother Temple of all previous Dalai Lamas. The 2nd, 3rd, 4th and 5th Dalai Lamas all had the seat in the monastery. Among them, the 5th Dalai Lama had mastered the local power of Tibet in the monastery. The monks in the monastery are very kind. 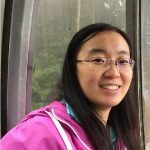 And if you can invite them for visiting the monastery, you will gain a lot from them. There were once 10,000 monks studying in the monastery. 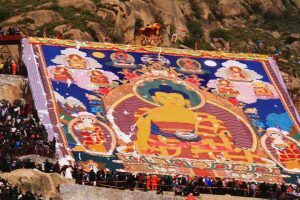 Sho Dun Festival is a big event in Drepung Monastery. You can see the Giant Thangka Display and enjoy the Tibetan opera. So, if you visit the monastery during the festival, it can be fun and unforgettable. For more Tibet attractions, please follow our Tibet Travel Blog.